Time again for the Mock Caldecott Awards, at which we convene not to mock Caldecott-winners, but to predict what the winners will be. This year, we’re of course predicting the 2014 awards, which will be announced next month. A big thanks to Kansas State University’s Children’s and Adolescent Literature Community (especially Allison Kuehne and Melissa Hammond) for organizing this event, and to the Manhattan Public Library for hosting it. 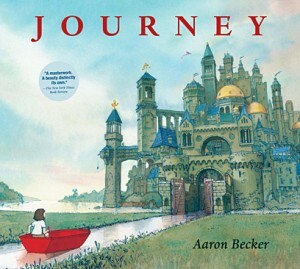 An homage to Crockett Johnson‘s Harold and the Purple Crayon and (as some of my colleagues pointed out today) to David Wiesner‘s work, Aaron Becker‘s Journey invites us to travel along the line of our imaginations, transporting us into a world of Miyazaki-esque wonder. According to our votes, it was the winner by a good margin. My own opinion is that I’d be surprised if the Caldecott committee failed to grant this at the very least an Honor. Oliver Jeffers, The Day the Crayons Quit (text by Drew Daywalt). As one of our group observed today, the Caldecott is about telling a story through pictures, and in this book the tools of art are our narrators. They write letters of protest to their owner, citing misuse (often overuse), and seek redress. Spoiler alert: By the end of the tale, the child artist hears their grievances, and finds a new way of using color in his work. 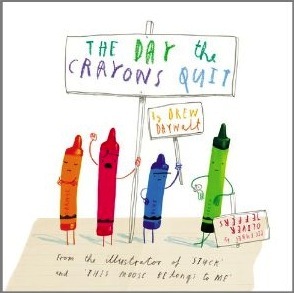 Like the above book, Jeffers and Daywalt’s The Day the Crayons Quit is also a meditation on the artist’s process. Only this one is funnier. 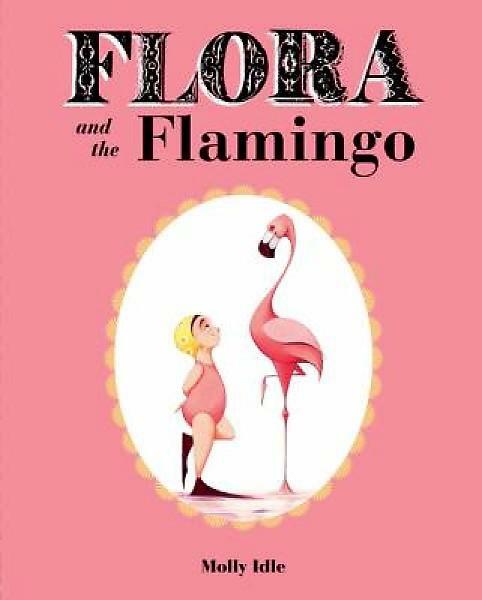 With beautifully expressive drawings, a line as smooth as Al Hirschfeld’s, and a magnificent use of white space, Molly Idle‘s Flora and the Flamingo offers much to admire. Flora, a little girl whose physique does not suggest “ballet,” aspires to that sort of physical grace. With the help of the flamingo, the two dance a sublime, gently comic, duet. Lifting the flaps (on the pages on which they appear) allows the reader to better “see” the movements of both girl and bird. I’d read nearly all of our finalists prior to the Mock Caldecott conversations, but today was my introduction to Idle’s work. I look forward to reading more of it. As is always the case, there were many great books that don’t get the votes. 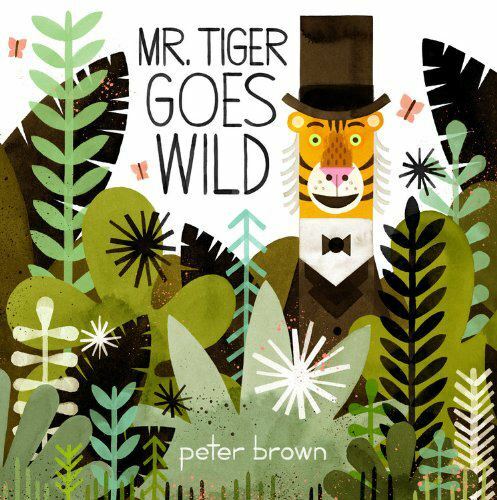 Peter Brown‘s Mr. Tiger Goes Wild came in fourth in our voting. It’s an hilarious, well-designed story of the need to, well, go a little wild every now and then. (I read it is a kind of a riff on Where the Wild Things Are.) Our other finalists were Melissa Sweet‘s Brave Girl: Clara and the Shirtwaist Makers’ Strike of 1909 (text by Michelle Markel), Jon Klassen‘s The Dark (text by Lemony Snicket), and Eliza Wheeler‘s Miss Maple’s Seeds. I really wanted to see Bob Staake‘s Bluebird, Frank Viva‘s A Long Way Away, and David Wiesner‘s Mr. Wuffles among the contenders, but none of these garnered a majority’s worth of votes. Nor, sadly, did Lizi Boyd‘s Inside Outside, and, ah, I could go on. But I won’t. There were many beautiful picture books published in the U.S. in 2013. As my colleague Joe Sutliff Sanders observed, this has been a great year for book design. I’m paraphrasing him — but that was the gist of his comment. And he’s right. What are your favorite picture books from 2013? Which one do you think deserves the Caldecott Medal? Would Emily Hughes’ ‘Wild’ count? I have a feeling this book will provoke some strong reactions, but it really is an amazing creation. JoeyC: I’ve read great things about Wild, and it’s on my to-read list. I think Emily Hughes is based in the UK, which (if I’m right) would make her work ineligible for the Caldecott. But thanks for mentioning it, just the same. You’ve reminded me that I’ve been wanting to get a copy of this book. In any case, people should feel free to use this space to mention any notable picture book of 2013 — doesn’t need to be Caldecott-eligible. This one would fall under “should have been contender, but is not from U.S.” called “Brief Thief” by Michael Escoffier and Kris Di Giacomo. Translated from French to English by Enchanted Lion Books. I do believe Ms. Emily Hughes is Hawaiian. Might want to check up on that, but that’s what I heard. Betsy: Ah, is she? I thought she was sort of the inverse of Oliver Jeffers (from the U.K., but lives and works in Brooklyn) in that she was from a U.S. state but lived and worked in the U.K. However, you’re more likely to know the answer to this than I am! Nancy Vo: I love Enchanted Lion’s books. They publish great stuff, a lot in translation. I do not know Brief Thief. I’ll have to check it out. Thanks for the tip!